The United States Rottweiler Club strongly believes that these tests are vital to maintain the Rottweiler in type and temperament and should be the cornerstone of any breeding program. 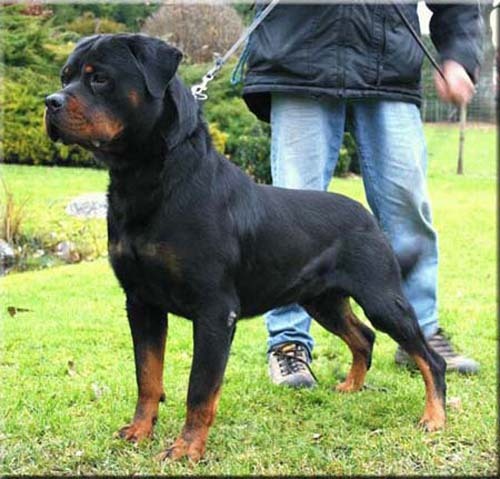 The BST is designed to select those Rottweilers that are worthy of being bred and is modeled after the standards of the breed test used by the German Allgemeiner Deutscher Rottweiler-Klub (ADRK), the Zuchttauglichkeitsprufung. The United States Rottweiler Club (USRC) calls the test the BST and the ADRK calls the test the Ztp. The Ztp and BST are basically the same breeding suitability test. The test evaluates the dog's conformation and character to determine if the dog is a suitable candidate in a breeding program in both type and temperament. In Germany, a litter may not be registered unless both the dam and the sire have passed the Ztp! The dog must have passed the BH (Canine Good Citizen equivalent). The dog must not have any disqualifying faults according to the standard of a Rottweiler. The dog must have a passing hip evaluation from The Orthopedic Foundation for Animals (OFA). If the dog is not within the FCI standard (i.e. too tall or too short etc. ), or has a disqualifying fault, the dog may NEVER be retested and will NEVER be bred. The ADRK calls the Korung, Gekort or Gek.b.Eza, The USRC calls the test ABST, it is similar to the ZTP but the working requirements are higher.It's not really necessary for breeding, it's optional. The meaning of Korung is to select the best breeding dogs out of all the dogs with a Ztp (Breed Suitability Test) It is written in the ADRK rules that we should utilize these few selected dogs in our future breeding since they display the strength in character, strong and powerful self confidence. 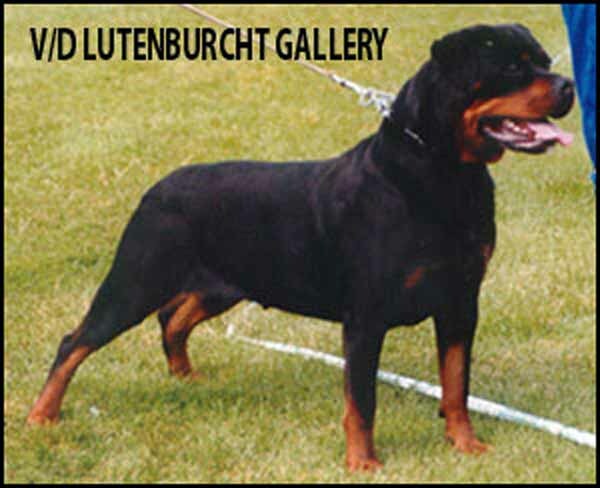 Rottweilers whom have passed the Koerung are a selection of special dogs in their appearance, temperament and working ability. - Be at least 36 months for (males) & 30 months for (females) & not older than 6 years. - Have acheived 3 show ratings (two of them in adult classes) from 2 different ADRK judges, graded at least V (excellent). - Dogs who pass are endorsed (Gekort) for 2yrs.The dog may take the Korung test again. The breeding value of a Rottweiler is derived from its ancestors and reflected in the quality of its offspring. 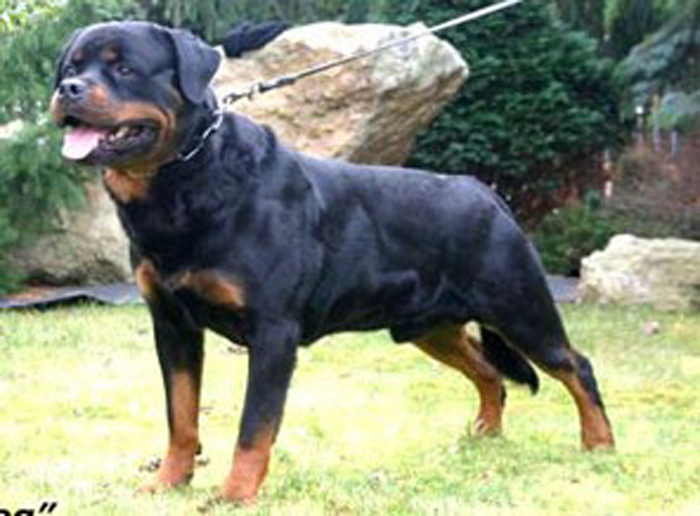 Rottweilers of value for breeding carry pedigrees that indicate the accomplishments of their ancestors. 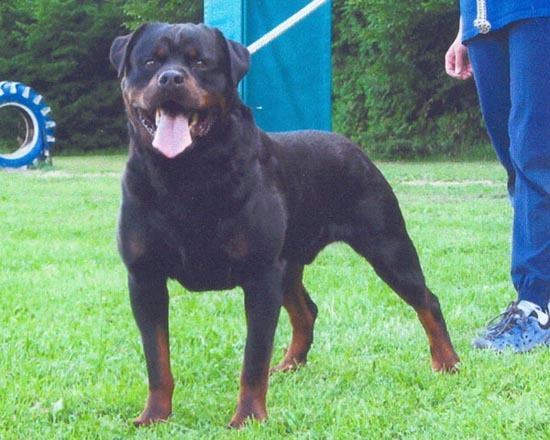 Dogbase was developed during my term as a member of the ADRK Board, and as an organizer, mainframe systems/applications programmer, and a breed specialist I brought my fair share into the completion of this project for the ADRK and our Rottweiler breed. We have 6 values, figures above 100 show an increase in the value, figures below 100 show a decrease. This database provides a numerical score in 5 categories: HD, ED, Head, Cheekbone, Bone strength . For every trait, "100" is neutral (average). A number higher than 100 means that a dog is more likely to exhibit that trait, a number lower than 100 decreases the likelihood of that trait. The first two categories (HD, ED) are the most important, they must not exceed 110 (if they are higher then the scheduled breeding is not allowed). The last three categories are "recommended". Optimally, for the first 2 categories the lower the number, the better. This means the dog is less likely to throw these traits. An example of a "good" HD number is around 95, a great one is around 85-90. It is not hard to find hips under 100, but good elbows (since they have only recently been examined) are more difficult to find. As a result, "100" is almost a good number for elbows, less than 100 is great and less than 90 is outstanding. The Rottweiler is considered to be one of the oldest dog breeds. Its origin goes back to Roman times. These dogs were kept as herder or driving dogs. They marched over the Alps with the Roman legions, protecting the humans and driving their cattle. In the region of Rottweil, these dogs met and mixed with the native dogs in a natural crossing. The main task of the Rottweiler now became the driving and guarding of the herds of cattle and the defense of their masters and their property. This breed acquired its name from the old free city of Rottweil and was known as the "Rottweil butcher's dog". Good natured, placid in basic disposition and fond of children, very devoted, obedient, biddable and eager to work. His appearance is natural and rustic, his behavior self assured, steady and fearless. He reacts to his surroundings with great alertness. Muzzle: The foreface should appear neither elongated nor shortened in relation to the cranial region. Straight nasal bridge, broad at base, moderately tapered. Lips: Black, close fitting, corner of the mouth not visible, gum as dark as possible. Tail: In natural condition, level in extension of the upper line; at ease may be hanging. USRC Adopted Exception: Docked at the first or second joint within 7 days of birth or left in its natural state. Lower thigh: Lower thigh: Long, strongly and broadly muscled at top, sinewy. Hind feet: Slightly longer than the front feet. Toes strong, arched, as tight as front feet. Color: Black with clearly defined markings of a rich tan on the cheeks, muzzle, throat, chest and legs, as well as over both eyes and under the base of the tail. Forequarters: Narrow or crooked front legs. Steep shoulder placement. Loose or out at elbow. Too long, too short or too straight in upper arm. Weak or steep pastern. Splayed feet. Too flat or too arched toes. Deformed toes. Light colored nails. Color: Markings of incorrect color, not clearly defined. Markings which are too spread out. 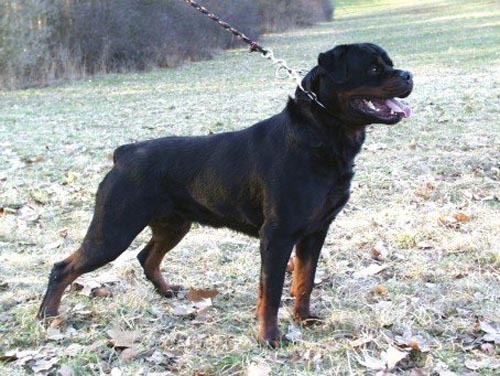 Color: Dogs which do not show the typical Rottweiler coloring of black with tan markings. White markings. Crate training is an excellent way to housebreak your puppy and control it's sometimes destructive puppy behavior, like chewing on your furniture! Crate training assists in housebreaking by using a dog's natural instinct to not soil it's den. Some people may think crate training is "cruel", when in fact, crate trained dogs enjoy their crate as a safe, quiet place to retreat when they are tired or want to be left alone. Further, crate training assists you in training your puppy to avoid undesirable behaviors when your puppy can't be watched and ensures that your puppy gets the rest it needs. Probably the most compelling reason for crate training your puppy is in the event your rottweiler requires care from a veterinarian. Having your dog at ease with being restrained to a crate may someday make the difference in your dog's well being, or even its survival. Select a crate that is large enough for the puppy or dog to turn around in and comfortably lie down. A crate that is too large will allow a young puppy to eliminate in a corner, while remaining comfortable lying elsewhere. With most wire crates and some plastic crates, you can purchase divider panels which can be adjusted or removed as the puppy grows. A puppy may require more than one crate to accommodate it while it grows. For puppies under one year of age, it is much safer for your pup to be crated in a plastic airline style kennel (i.e. Vari-Kennel) or aluminum dog box. With this type of crate, your pup is less likely to injure itself by getting a paw, leg or jaw stuck. For older dogs, wire crates provide better air circulation and are roomier. Fold-down, suitcase-style wire cages (i.e. Midwest, Precision) are also portable and easy to set up and take down. These types of cages generally work best for dogs that are already crate trained. Soft crates are made out of denier nylon, nylong mesh and aluminum, and are lightweight and portable for travel. They are not; however, recommended until your dog is thoroughly crate trained, and should be used only when you are in close proximity to your dog as they can be easily broken out of or chewed through. For most full-grown adult rottweilers, an extra-large crate will accommodate most males, and a large or extra-large crate will accommodate most females. Don't be tempted to buy blankets, pads or beds for inside the crate if you have a young puppy. Not only will they usually become expensive chew toys and present a choking hazard, but they interfere with effectively housebreaking your pup. Puppies do not want to lay in their urine, and using absorbent material in a puppy's cage allows your pup to eliminate, while staying dry and comfortable. Water and food can be placed in your puppy's crate when you are close by to supervise. Keep in mind that young puppies need to eliminate immediately after eating and drinking, as a puppy can only "hold it" for very short periods of time. A good rule of thumb is that a puppy will need to eliminate every x number of hours, with x being the age of the puppy in months, plus 1. (i.e. a 2 month old puppy will need to eliminate every 3 hours, a 7 month old puppy will need to go at least every 8 hours). NEVER EVER leave your puppy or dog in a crate with it's collar on! If your dog catches it's collar on the crate, it can seriously injure or choke your dog! 1. Feed your puppy in it's crate with the door open. Initially, don't disturb or distract your pup while it is eating and learning to experience being in the crate. 2. After the puppy has eaten confidently with the door open for a few meals, quietly close the door while it eats. 3. Once you are sure the pup is confident eating in it's crate, place the pup in it at non-feeding times for a few minutes with a safe chew toy, gradually increasing the time left in the crate. Never let your puppy out when it is crying or barking. Only let it out when it has been quiet for at least one minute. This is critical so it will not associate acting "bad" with being rewarded by being let out of it's crate! You may use pieces of dry food or treats as a reward for being in the crate and being quiet. 5. Crate your puppy any time you can't watch it closely. Puppies can get into trouble very quickly when not keenly supervised, and using a crate for this purpose will assist you in teaching your puppy what behavior is acceptable and what is not. It will also keep your puppy safe from household dangers that could possibly injure or endanger it's life. Again, never discipline your puppy by placing it in it's crate or your pup will associate it's crate with punishment. You want the crate to be a happy, safe and peaceful place for your puppy. It bears repeating, NEVER EVER leave your puppy or dog unattended in any crate with a collar on! If your dog catches it's collar on the crate, it can seriously injure or choke your dog! "I would suggest breeders make good use of such flesh foods as the following:...paunches of all animals (the raw, uncleaned paunches of healthy grass-fed animals can be fed with much benefit to all breeds of dogs). I learned this from a gypsy in the Forest of Dean: this man had bred many famous greyhounds, and he told me that such fare was the finest of natural food tonics." Tripe is the stomach of ruminating animals. These animals (i.e. cattle, buffalo, sheep, deer, goats, antelope, etc.) are classified as being four-footed, hooved, cud chewing mamals with a stomach that consists of four chambers. The four chambers of such a stomach are known as the rumen, reticulum, omasum and the abomasum. The food the animal eats (i.e. grass, hay) is swallowed unchewed and passes into the rumen and reticulum where it is then regurgitated, chewed and mixed with saliva. It is again swallowed and then passed through the reticulum and omasum into the abomasum, where it is then further broken down by the gastric juices, amino acids and other digestive enzymes. Yummy! So how can something so disgusting, be so good? These same gastric juices and enzymes not only aid the animal in digestion, but also aid the dog in digesting and efficiently utilizing his food. The amino acids are necessary for muscular development and, the other gastric juices, I believe, are the best cleaner for their teeth! In an analysis of a sample of green tripe by a Woodson-Tenant Lab in Atlanta, Georgia, it was discovered that the calcium:phosphorous ratio is 1:1, the overall pH is on the acidic side which is better for digestion, protein is 15.1, fat 11.7 and it contained the essential fatty acids, Linoleic and Linolenic, in their recommended proportions. Also discovered, was the presence of Lactic Acid Bacteria. Lactic Acid Bacteria, also known as Lactobacillus Acidophilus, is the good intestinal bacteria. It is the main ingredient in probiotics. The white tripe that you find in the grocery store has been cleaned, scalded and bleached. It has almost no nutritional value for the canine. This tripe is usually found in dishes such as menudo. Green tripe does not necessarily refer to it's color. In this instance it refers to the fact that it has not been touched - not cleaned, not bleached and not scalded. It's actual color is brown, however, sometimes there will be a greenish tint due to the grass or hay the animal ate just before slaughtering. Our sources are from GRASSFED and ORGANIC animals that are USDA inspected and passed for Human Consumption. They are antibiotic free and no hormones have been added.